Did you enjoy Spelunky on XBLA and think, “This is great and all, but I wish this game was somehow harder and more like Ninja Gaiden?” Then you may want to start wearing a tinfoil hat, because the folks at Adult Swim Games and Megadev read your mind. I won’t lie; I had every intention of writing about ZombiU today because of its special edition re release. Leave it to a game about a Ninja to steal the title at the last possible second, making Super House of Dead Ninjas my Game of the Week. House of Dead Ninjas is graced to us, curiously enough, by Adult Swim Games. If you haven’t been keeping up with the curious gauntlet of high quality games rolling out over at adultswim.com, then you may want to take a moment to explore the site. It seems like every week something comes out that challenges my belief that web browser games are somehow a lesser form (and I think the somewhat recent Westerado finally shattered it entirely). The attacks happen so fast that its quite difficult to snap a screenshot. 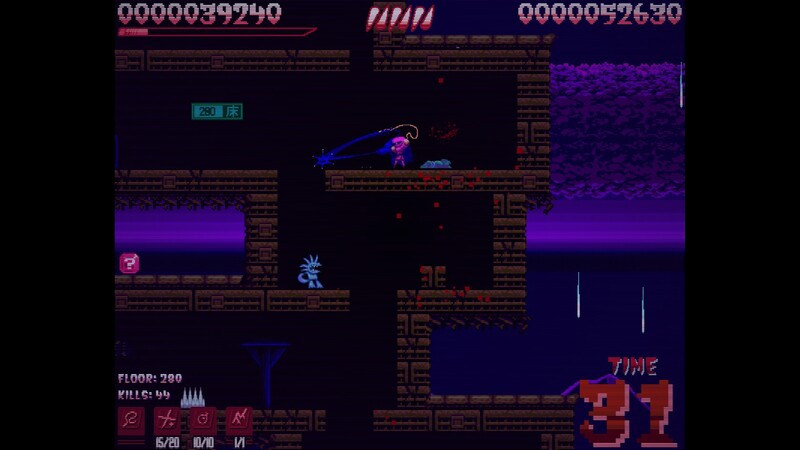 Super House of Dead Ninjas, (which I almost wrote as House of the Dead Ninjas on more than one occasion) summons up memories of a great number of old school games, the most obvious being Ninja Gaiden. There’s very similar wall jumping, shuriken throwing, magic using mechanics at play, but it all happens at a much faster pace than the spiritual predecessor. 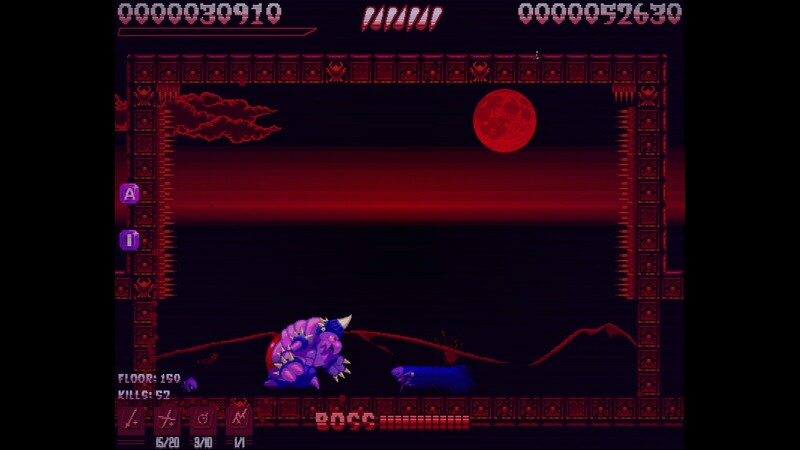 Unlike the linear progression of Ninja Gaiden though, House of Dead Ninja randomly generates its level as you go along. Progress is measured by the furthest floor descended as you drop down a massive tower. You’ve got a plethora of lives and two continues to burn through, and on subsequent playthroughs the game will allow you to pick up from a later floor, and save you the trouble of trying to clear every floor in a single run. Hard mode awaits for the brave, which is mostly the same game... but without the option to continue once all lives are expended. Oh, and if you’d like to see the final floor, you’ll need to make the last run on this mode. May the Ninja Gods grace you better then they have me. The closest thing to linearity is boss fights that occur at certain depths. The walls are covered in spikes to keep you from abusing your wall-climbing ninja power while fighting these tougher enemies. Also like Ninja Gaiden, these bosses suffer from short term memory loss and will happily act in the same repetitious actions while you wail away on their backside. Once you get their patterns down, the boss fights become less intimidating, but there’s still that lingering chance for one little slip up to cost you dearly. Its also worth mentioning that the bosses fought are also randomized, so you might get blindsided on subsequent playthroughs by a boss you’ve never seen before. Be ready for that, because I sure wasn’t. Hey, uh, when you do this part? Don’t charge right at him like that. Trust me. I’ve talked a lot about dying and difficulty, but make no mistake, Super House of Dead Ninjas rewards as much as it punishes. Its easy to get the sense the game wants you to be quick, since it sticks a timer at the bottom right and plays tense music for the last few seconds. At 0, the grim reaper himself shows up and, well... I hope you’re still moving fast when he does. On the more positive side, landing lots of killing blows in quick succession will render you invincible. Keep landing killing blows, and you can keep the invincibility alive and skate through fields of spikes like they were flower petals. And the game has plenty of other rewards waiting, too. Before jumping into the tower for the first time I was immediately overwhelmed by the amount of future options at my disposal. There’s an entire screen of grey boxes upon starting the game, but there’s no veiled or hidden unlocks here. Each new item in your arsenal is earned through completing challenges, and the game will let you know exactly what it expects from you to earn it. Some unlocks will even come just as a result of playing the game enough times. As an example, the first thing I unlocked was all the bonus lives. These are earned by dying. I’m not proud, but I sure can get farther now. Yeah. Wow. 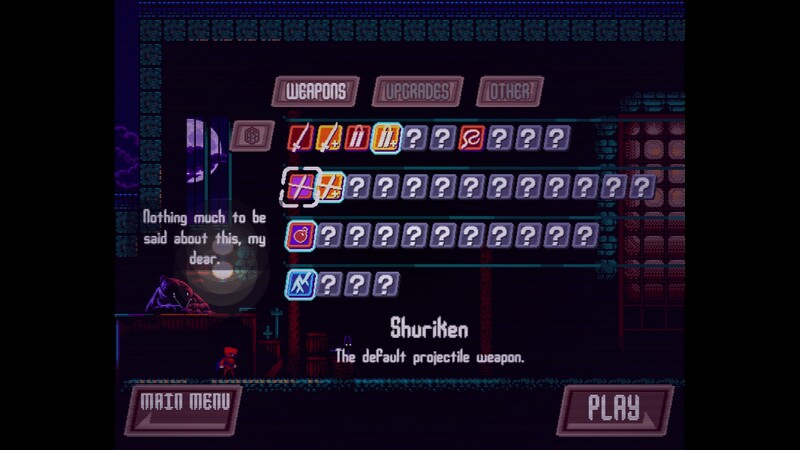 That’s a lot of question marks left to unlock. The best part of all of this, though, is that you can find out if you’d like to play this right now. Right now! And not pay a dime. There’s a non-steam version waiting on the adult swim website with less content. If after trying it you suddenly notice its five in the morning, a more robust version awaits both of us on steam. The price tag is $4.89 until March 4th, after which it will return to its normal retail price of $6.99. 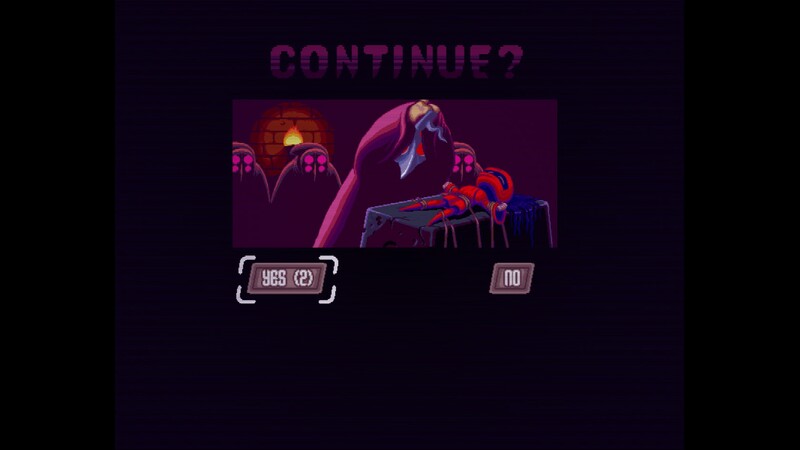 Best continue screen I’ve seen since Double Dragon: Neon, and thats a tough one to beat.